Simplicity Rotary Cutter & Embosser and Bias Tape Maker: GIVEAWAY! I discovered the most darling handmade bias tape for sale on Etsy a while back and wondered who in the world would want to do that much cutting and ironing? Thankfully, Simplicity was so kind as to send the Deluxe Rotary Cutter & Embosser to me to try out. AND…they also sent along the Simplicity Bias Tape Maker! Wait until you see how much fun these machines are!! I sewed the lengths of strips together on the diagonal. covered the plate and started the machine. 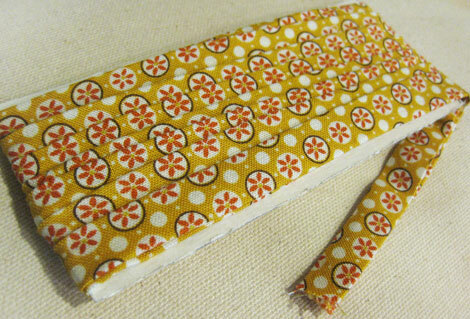 I pressed my bias tape in half and wound around 2.25″ wide recycled vintage rick-rack & seam edging cardboard pieces. 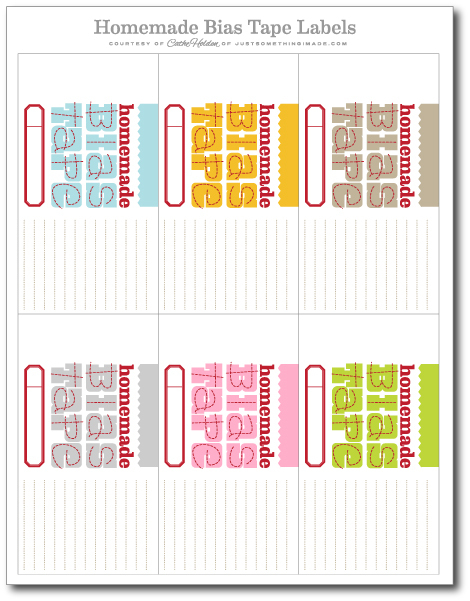 I designed some fun labels and wrapped them around the bias tape cards with the size and lengths noted. 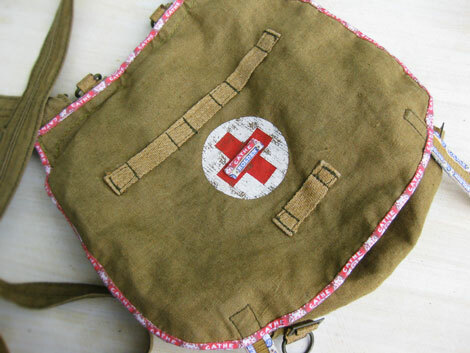 I thought cigar box label designs would pair so great with one of my favorite bags- a vintage military medic pouch. I love this thing, as funky as it is. It’s the best flea market purse and my iPad fits into it perfectly. So once I had the hang of making bias tape, I thought it would be cool to make my own designs. I scanned a couple of cigar box strips and modified the wording in Photoshop to my name and monogram. Because I can. I printed the designs in rows onto inkjet printable cotton sheets. With the paper backing still attached to the cotton, I ran the strips through the rotary cutter. I removed the paper backing and seamed the strips together on my sewing machine before running them through the bias tape maker. 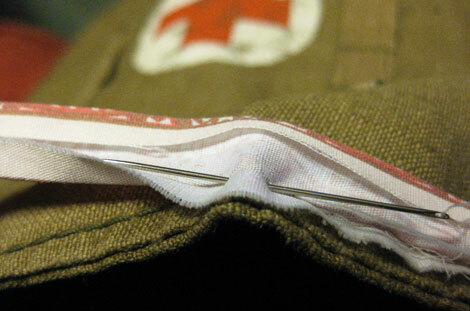 After pressing the tape in half, I hand sewed the tiny bias tape around the flap of my bag. No easy task as that military-grade fabric is incredibly beefy. I chose hand-sewing because of the width of the tape, I knew I’d never get through all those layers with any kind of precision on a sewing machine. I think my personalized catch-all bag turned out fun. And it just goes to show that the sky’s the limit with these awesome Simplicity machines! Just THINK of the things you can trim! TO ENTER to win one of the Simplicity machines, please visit the Simplicity website and leave any kind of nice Simplicity product-related comment on this post. ENTRIES CLOSE on Saturday, August 20 at noon (PDT.) Winners will be randomly chosen, notified and posted right here shortly after close of the giveaway. Entry Closed. This entry was posted in cigar boxes, Giveaway and tagged Bias Tape, Giveaway, Sewing, Simplicity. Bookmark the permalink. 696 Responses to Simplicity Rotary Cutter & Embosser and Bias Tape Maker: GIVEAWAY! OOh, I hope I win! I love using custom bias tape, but I wish it were quicker and easier! I love the Cynthia Rowley patterns from Simplicity. Oh my! This bias tape machine has been at the top of my wish list since it came out!! I am SO hoping to win it!! Thank you so much for doing this giveaway!! I have been drooling over the bias tape maker for some time! Not literally. That’d be gross. I love matching bias tapes on my quilts and projects but it can get a little tedious. I have my steam-burned fingers crossed for this one! I love the Simplicity patterns, which are almost ALWAYS on sale at my local material shops. The rotary cutter is fabulous! What a time saver. What a great idea! I love how you transformed your find into something with your personality! Possibilities are endless with this! Thank you for sharing! Thanks for sharing and have fun with your biais band! I’m glad I followed the link to the Simplicity site, I didn’t realize they sold out of print patterns on the site. I love those Cynthia Rqwley tools! I really like your tape labels too! Oh, how totally fun are those gadgets!? Simplicity has been a part of my life since junior high home ec class . . . to many years working in a fabric store! I’ve been coveting the bias tape maker for awhile . . . but now that you’ve shown me the Cutter/Embosser, I think I’m even more in love with that!! As a paper & fabric crafter, it seems like a most useful tool!! Thanks for the chance, Cathe! I love Simplicity and you have me drooling over these the rotary cutter and bias tape machine (putting them on my Christmas wish list right now!) Simplicity has some nice dress forms that I love, too. Especially the 601 Ladies Dress Form with hips. I love the bias tape packaging and how well it compliments the colors in the fabric that you chose. So nice to see that the cutting/embossing machine has a wide variety of blades and rolls available. I would for sure get the pinking blade! Love their selection of bias tape but making your own is so much cooler, and these make it so much faster! I love these machines! Gotta have one!!! I didn’t know Simplicity had all of these products! I’m fairly new to the sewing game and just thought they did dress patterns, but… wow. Color me impressed. The Rotary Cutter and Bias Tape Maker are just the tip of the iceberg. I’m drooling looking at some of these products. with baby #2 on the way – their baby patterns are sooooooooo cute!! I’ve been sewing with simplicity patterns forever and they are all really great and so easy to follow!! I would LOVE to win either product! I’ve had my eye on them both for a while now! I’ve just discovered the world of bias tape and have been looking at a bias tape maker like this one! Would LOVE to win it. I’ve been a fan of Simplicity patterns for ages. SO easy and simple. I just saw they had dress forms for sell as well! I’ll be adding that to my wishlist 🙂 Thanks! Oooh I need this! Unbelievably cool! Simplicity is by far the best company for inventions relating to sewing and crafting, and have been for generations! I wonder how many moms have moms that used Simplicity patterns and products? I need to do research. This is sparking a few questions! When did Simplicity begin? Can I make bias tape out of blue jean fabric? I need to find an apron pattern. Headed for the simplicity website again, they are full of cool ideas. Thanks for helping us all have a chance to win! I love Simplicity! My daughter got into sewing after receiving a sewing machine for Christmas last year (she’s 7) and we have been perusing Simplicity patterns for things for her to make. One of these machines will take her creativity to another level! Thank you so much for the opportunity! The bias tape maker looks so cool. I even saw the cutter at walmart the other day. I was wondering what it could be used for until I saw this. super cool! I diddnt know simplicity sold dress forms. thanks for the gievaway! I’m certain I NEED THESE!!! Love Simplicity–we mixed and matched two Simplicity patterns to create my wedding dress! WOW!! How fun is that?!!! The possibilities are endless! I have never seen those before–thank you so much for showing them to us!!! Wow what an awesome giveaway!! Those two machines make it all look so so easy! I would dearly love to have either one of them. The Simplicity page just has it all doesn’t it? From out of print patterns, to new loom knitters and the Crochet Dude. Just wonderful. Oh my! SimPlicate rocks! I’ve wanted the bias tape maker for awhile, but wasn’t sure if it worked. So thanks for sharing all the gorgeous tape you made! Fingers crossed I win! I made bias tape all weekend… burning my fingers and toiling for hours… the bias tape maker would have turned my task so much faster! I’ve used Simplicity knitting products for years and have always loved the quality. I have no doubt that the bias tape maker will be just as high quality. Me likey!! I’d LOVE to add the SIMPLICITY rotary cutter AND the bias tape maker to my DOMESTIC ARTS ARSENAL. I can already envision some of my grandma’s flour sack collection being made into bias tape for quilts. Thanks for being a fabulous resource! I have the gadget to use with my own iron to make bias tape and it’s pretty handy, but a machine to cut and then iron and everything?!!? that would be awesome! I love Simplicty products and their website and newsletter always give me great ideas. Cathe Holden and Simplicty are a match made in heaven! I can’t stop thinking of all that I would do with these awesome tools! Ohhhhh. The bias tape machine. What can I say. LOVE! I didn’t know Simplicity sold dress forms. Hummmm. Wow! Those are both very cool products. I am just beginning to crochet and I like the Crochet Dude’s products. Especially the beginners kit! I love Simplicity’s Learn to Sew pattern line. The patterns are simple enough to make, which leaves me time to be a little more creative in the embellishing. Once I get the basics of a pattern down, I can figure out how to add simple embellishments (I am in love with piping right now!). Just today, I was in the fabric store and walked past the Bias Tape Maker, and I said, “I so want one of those!” That would just be too much fun to play with, and all of my friends who sew would be getting custom bias tape for Christmas (wrapped up cute using your printable labels!). Thanks for the chance to win one! Oh my goodness… Simplicity brings up such sweet childhood memories. I cut my sewing teeth on patterns made by Simplicity, under the watchful eyes of my Mom and Grandmother. I’ve been eyeing that bias tape maker for some time now… and to the Rotary cutting and Embossing dream machine… very nice to meet you! I have been eyeing that bias tape machine for ages!! I hate making bias tape, but I often have need of it. I just checked out the Simplicity website and am surprised out of print patterns can be ordered. The bias tape machine looks so cool! Oh, they have Ottlites! My MIL just got one for her birthday and she looooooves it. Oh my goodness! I’ve wanted both of these machines for quite some time, but now I have to have them!! What brilliant ideas. Thank you for the inspiration and the giveaway! I love their patterns, and love bias tape, so, MAN, would I love to get my hands on either of these! 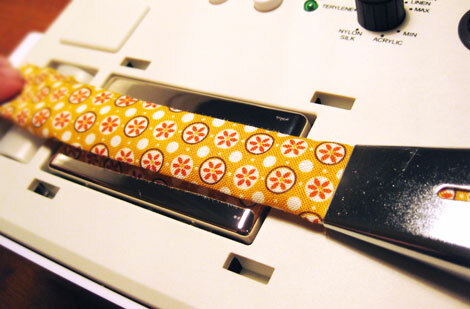 I have made my own bias tape… and well it was too much trouble by hand… but a machine! Wow! I would be able to trim all the aprons, napkins and other goodies I make. And… good to know about the Simplicity site! I didn’t know I could order online from them! Boon to me! I’ve never seen a cutter like this one before. Now I’ve seen it I’m not sure I can live without one. To win would be wonderful. oh- the bias machine is amazing! would absolutely love to win- it looks like too much fun! Neato!! I love hat they sill sell their old patterns. I found a few my mom used for me hen I was a baby! Would love to win this! I’d revolutionize my newborn gift giving routine! I’m just learning to sew and using bias tape and piping for the first time! Would love to cusomize fabric like you did with the cigar boxes! Love it! Oh what a cool little machine that bias tape maker is! I mostly papercraft but I have been doing some sewing lately so I would be thrilled to win either one of these! Thank you for such a great opportunity! What fun products, and thanks for the great ideas! I love Simplicity patterns! You are amazing! 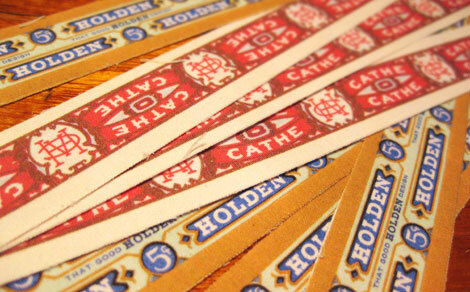 Cigar labels turned into bias tape leaves me speechless. Right now I’m drooling over the Cynthia Rowley designer tool sets at Simplicity. So cute and handy. It’s a terrific combination. I ab-so-lute-ly love the adorable Halloween costume patterns that Simplicity has (especially now that I have a little princess who loves to dress up)! Never knew that I needed a bias tape maker until now! I love the Flexi Lace Hem Tape on the Simplicity site, so pretty! Went by for a visit lots of things to look at, loved that felting machine. That rotary cutter is very cool, love that it also cuts paper! My new love, well next to sewing, knitting, painting………. I L-O-V-E all of the kiddie fashion kits (and light boxes) My Daughter would have hours of fun creating with any of those. And I could think of so many things to do with this machine! I love Simplicity products. They are high quality and not pricey. Plus the patterns are super simple to understand. Oh wow, I would love to win this! It seems I always want fun bias tape and can only find boring colors, I’d love to use this! I’ve been wanting one of those rotary cutters for awhile. I make quilts and there are a hundred ways I could use that machine. Not to mention for bindings or rug hooking! both of these machines look pretty cool. I would also love a serger! I’ve always loved Simplicity patterns. This Rotary Cutter & Embosser plus the Bias Tape maker are such wonderful inventions! Thanks for the chance to win them! love the help and tutorials for quilting. But that is not saying I don’t love these great machines. I would sooooo love these. 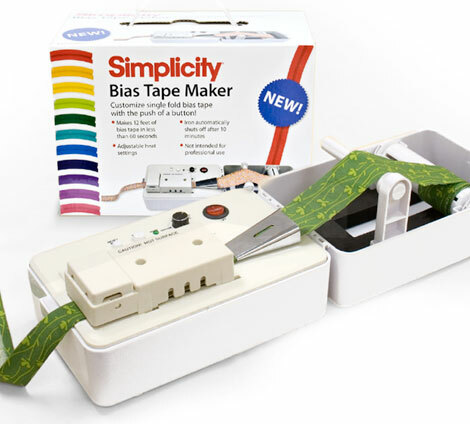 This Simplicity bias tape maker looks awesome – would lovelovelove to win one. Leave to Simplicity to come up with this – they are awesome!!! I love all of the choices with Simplicity patterns. Their bias tape maker is on the top of my wish list! Thanks for the chance to win! I had no idea before visiting the site that Simplicity and Boye were the same group. I’ve loved the new Boye products. As a crocheter, it’s great to see yarny products that aren’t called knitting accessories. The project bags are really useful and durable and aren’t called knitting bags! Plus there’s Drew’s super colorful crochet things. My mom had wanted one of these machines for Mother’s Day but found out how much they are and told me not to get her one 🙁 I was going to because I don’t think the bias tape maker is too expensive but she’d be upset with me. I think she’d be okay if I won one for her 🙂 And then I could use it, too! Like the Sew Simple patterns for easy things to make. Would love to have these two giveaway items – either one!! How much easier to make bias tape for projects i have waiting to be done!!!! I hadn’t seen either Simplicity machine before your post. I could see this being very handy for me, as I love both fabric and paper. Oh my goodness!! I had no clue they made machines like that!! I would say the bias tape maker would be the top of the list for me. But either one would be amazing!! Simplicity pattern 2058 is going to be my go-to skirt for this fall/winter! This is like a dream come true opportunity. I would be over the moon with either of these sewing tools. I did go to the Simplicity website and I got so deeply involved your comments went from 48 to 65. Item #SWP.01 the Singer Steam Works Pro Iron because I do still iron clothes and sheets…or item #604 the Dress Form with Hips…or all of the Venice laces they carry. Their It’s So Easy patterns are my favorite! As a little girl, my grandma used to get the Simplicity patterns catalog. I would look through it for hours planning out the beautiful outfits we would make together. We didn’t get around to making many of the ones I picked out, but just the name Simplicity brings back fond memories of time spent at her house. As an adult, I have even inherited some of her old patterns for re-use with my daughters. I love my Sidewinder! Simplicity makes the most useful products, I would love to have all three. The rotary cutting machine would be super helpful for making clothesline coil baskets. Love these!!! I’ve seen them online a few times but never saw how they work. This is great!!! Thanks for the chance of winning. What a great website Simplicity has. I spent a ton of time checking out all the Sew Simple patterns! They even carry out of print ones! And, may I say, great giveaway, thanks for the opportunity. Finally, girl, you rocked the rotary cutter and bias tape maker. I’ve seen a few other bloggers who have tried it out, but you REALLY tried it out. I love, love, love your personalized bias tape-trimmed Army bag! Amazing!!! oh, i hate making bias tape so much, i would love a machine to do it all for me! I remember crawling around on Simplicity patterns as a kid – it used to drive my mother crazy. I love how I’m all grown up now and Simplicity is still part of my life. I’ve wanted a bias tape maker for a while now – would love to win it! Thanks! woo-hoo! I love the Simplicity bias tape maker, been eyeing those FOREVR! I have had my eye on both of those tools for a while! I’m not sure which one I want more, so I would be happy with either. 😉 I also love their Art Activity Cart for kids. I had no idea they made such a thing! It’s that time of year again–we were looking at Simplicity Halloween costume patterns again today. Always a fun start to Fall. I love their sewing machine luggage. How I would love to be able to take my sewing machine safely on an airline with me. Oh, I want one! Actually, I want one of each! I have seen the bias tape maker but I have not seen the other one yet. It sounds like so much fun. Oh my, my head is spinning with all of the crafting ideas that I could use this for!!!! Thanks so much to the folks a Simplicity! I have loved their patterns for years! I visited the Simplicity site and know that I will be shopping soon for the crochet baby hats and headbands to make gorgeous accessories for our grandbaby. I’m thinking either the rotary cutter or bias tape maker would be wonderful in sewing bibs, etc. I would love to win this giveaway to make some cute outfits for my grandkids! Thanks! I honestly didn’t realize there was so much stuff over on simplicity! Lovely ideas and great projects to boot! Count me in! Those machines look fabulous. I really love how you made your own personal seam binding, it looks really awesome on the purse. I was over at the Simplicity website and they have loads of things. I love the jewelry trim and I love the Madeira embroidery threads. So pretty! wow! How about those Cynthia Rowley tools. Are those cool or what. Almost makes me want to do some home improvement. I have always loved Simplicity patterns, and it is nice to know you can order discontinued patterns from their website. There are some wonderful “oldies but goodies”. How cool are the new Rotary Cutter and Bias Tape Maker! Oh this is so cool! I would love the cutter & embosser and bias tape maker, my work schedule has changed that I have increased my amount of crafty time this would help make crafty time efficient! I love simplicity patterns. Both these products look fantastic. I make my own bias tape all the time and this would sure speed things up! I have used the bias tape maker and LOVE it. It is fascinating to watch. I would love a chance to win the rotary cutter too. I have been really wanting a bias tape maker and now that i see they have a cutting machine to go with it i want one even more! I love both of these machines. Cutting bias tape is not my favorite thing. Growing up, all was always the time to peruse the bg, paper catalogs at the fabric stores. Now I can just peruse online. I love Simplicity patterns. I have been using Simplicity patterns since I learned how to sew in the 8th grade. They are definitely the best! Simplicity seriously is one of the best sewing companies out there, I’d say that even if they weren’t having a giveaway. I have been coveting that bias tape maker ever since they first came out with it. Custom bias tape is the best. Be still my heart, this would be such a treat! Simplicity patterns are like candy to me (I’m not sure I’ll ever get to all those costumes), and I love the free craft projects on their site. Thanks for running another fabulous giveaway Cathe! Simplicity Halloween costume patterns are my favorite! My Mom used to make them for me when I was a kid and someday I hope to make my kids costumes too! I would love to try out the rotary cutter and bias tape maker!! So much fun! Wow, I didn’t know they had a website (should have!) I will for sure spend some time there. I loved the Simplicity rotary cutter and the bias tape maker! I quilt small bags and I’ve been doing it the hard way!! This would really make the job go much faster!! Wow, that was a really neat and comprehensive post. That was so cool the way you printed the binding with your name on it and how creative you were with the machine. The Simplicity site is another comprehensive piece of work, I enjoyed scooting around and have lots of new to me Newsletters to get. I enjoyed the read, thanks! What a GREAT giveaway. Winning ONE of the machines would be great, but BOTH would be awesome. Thanks for the opportunity. I was drooling over at the Simplicity website. I love Simplicity patterns! Right now I’m in desperate need of a new rotary cutter and mat so I got lost in gagaland over those. But honestly, if I had all the money and time in the world to shop there, I’d probably buy at least one of everything they have, especially the dress forms. What a great giveaway! I love Simplicity patterns because they really are SIMPLE! I’ve coveted one of these since they first came on the market. Usually, something else calls for my disposable income. Of course, if I won one of them, I could buy the other. I’m also intrigued by the new felting machine—I have a couple of techniques in mind that I’d like to try. 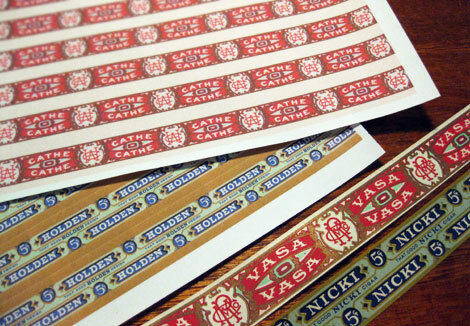 You have taken hand made bias tape to a whole new level with your personalised tape – amazing. I always thought Simplicity only made dress patterns – after visiting their website I can see they have so much more. oh this is the coolest giveaway EVERRRRRRRRRRRRRR. I love their dress patterns, I have one at home that i’ve used once which worked out super cool. getting ready to do some upolstery work and loved finding all that wonderfulness available just click and buy! the two giveaways would also help with that upcoming work as well!!!! thanks for the opportunity! You have worked some real magic with the Simplicity bias tape maker! Clever girl! Thanks for highlighting these products. I hadn’t heard of the Simplicity cutter/embosser. Love your fresh ideas! Wow!!! 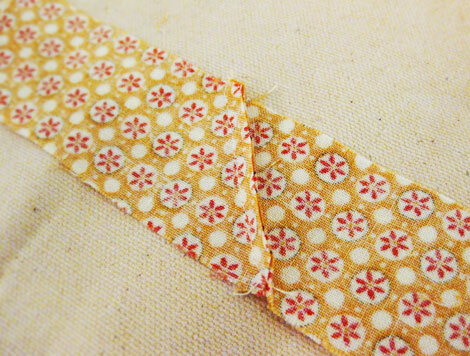 Bias tape is one of my favorite things to make and incorporate into books, mixed-media, sewing, etc, etc, etc. This is a really exciting giveaway. Thank you for the opportunity! I grew up with Simplicity products. They are always know to be innovative and reasonably priced for the serious home sewist! I LOVE Simplicity!! Their products are amazing and their patterns are a dream to work with. I am totally loving the new Lisette line of patterns and I’m anxiously stalking my local fabric stores for their next sale on Simplicity patterns so that I can get them all:) I would love a chance to win these amazing tools!!!! Either of these would be so awesome to have! It would make sewing that much easier! I love using Simplicity’s costume patterns for my kids for Halloween. Oh my goodness! I just made my own bias tape for a little bib I made for my granddaughter….wouldn’t these two little machines have come in handy?! And I JUST heard about the Crochet Dude at my knitting group! What a coincidence! Thanks for the chance to win! And thanks for the link to Simplicity! All kinds of things going on there! This post is so nice.. The gift they sent you..how you put it to such great use..the download..the bag. I have sewn w/ Simplicity since I am 12. I had no idea they had such great new tools. I am such a creature of habit, sticking to the same tools and supplies I’ve always used and Simplicity has so many wonderful items I’ll try. The bias tape maker would be fantastic for my quilts, pot holders, etc. How easy would that be? Thanks for the giveaway offer! I have never been to their website and I am amazed at all the products they carry! Patterns, dress forms, embroidery, and sewing machines to name just a few. Thanks Simplicity and YOU for this opportunity. I have had my eye on the bias tape maker for quite some time! I can only imagine the fun trims I could add to my projects. I love Simplicity patterns! I would love to win the Simplicity bias tape maker and Embosser!!! I sew elegant dinner aprons and use bias tape and they never make ones to make my fabric!!! I really need these!!!! I would love to have one of their adjustable dress forms. I would go crazy making clothes if I had that! I love the rotary cutter and tape maker! I can see myself making a lot of cool biased tape for the quilts I make. I make bias all of the time – this would make it fast and easy! Oh I’ve wanted one of each of these awesome little machines ever since they first came out! I grew up on Simplicity, you know, back in the day when they were the “only” pattern company and if a teen wanted new clothes she had to sew them herself. I’d also love to try one of their felting machines. So many toys to play with! I’ve always loved Simplicity patterns. I own a Simplicity Denim sewing machine and really need to use it more. Really like the portable Bobbin Winder – so useful in the middle of projects. Thanks for the chance to win. I just love the “simplicity” of the new Simplicity machines and tools. I was lingering over the Rotary Cutter and Bias Maker in my local sewing shop at the weekend and trying to work out how I could squeeze the purchase of both into my budget. When I found the JSIM giveaway, I was thrilled and figured I had as good a chance as anyone else, and how awesome would it be to win on my birthday! Good luck everyone! This is the COOLEST MACHINE EVER! Had no idea that such a thing existed. Oh the projects I could complete with just such a thing. I currently have “resew lawn furniture cushions” on my to-do list. Great giveaway. Wow! I love your cigarbox bias tape! Simplicity patterns have always been my favorite, and these machines look awesome. What a fantastic giveaway! I have been wanting to try these for ages! No blades to dull??? Oh my, oh my, oh my! What a wonderful thing – and the bias tape maker … no more burnt fingertips making my own? WOOHOO! My mother taught me to quilt when I was 6 years old, but Simplicity taught me to sew clothing when I was a teenager. Now I’m a professional costume designer. THANK YOU SIMPLICITY! Wow! My head is spinning with all the possibilities of things that I could do with the Simplicity machines. 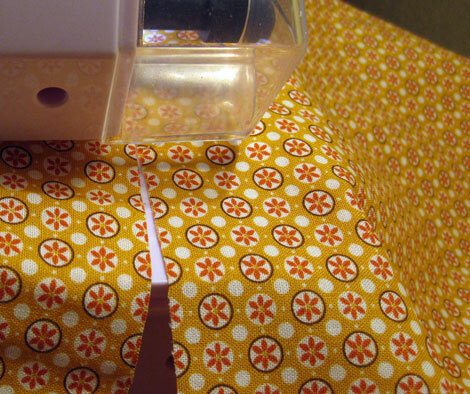 Oh…I can see so many fun projects using this Simplicity rotary cutter or the bias tape maker. Thanks for the giveaway! These are awesome. I make a lot of bias tape now using of these machines would speed the process up a ton. Those people at Simplicity are so clever! I love Simplicity patterns. So straightforward and easy to follow. Thanks for this bias tape and cutter giveaway! OMGosh, I never knew their site had so much on it…….they even sell toys!!!! I love the rotary cutter/embosser and would love to have it, but I’d be just as happy with the bias tape maker. Simplicity is really the only reason I can sew at all; I’m a klutz but their products are so easy to use! I saw both of those machines at Joanns and wasn’t even interested in them and now that I’ve seen that adorable bias tape I don’t think I can live without them and such cute wrappers too!, thanks for all the wonderful things you share. What a great project! I didn’t know Simplicity had so many machines for so many things! I had no idea a felt machine even existed until I saw it on their front page. Everything just looks like so much fun to play with! i have been eyeing both of these items for some time now but haven’t felt like i had the money…this is perfect! thank you for the chance! i love the tape you made for your bag! Ooo, how wonderful these would be!! I love Simplicity laces – gorgeous stuff!! ooh, a bias tape maker would make sewing up chef’s aprons for my husband soooo much easier. Simplicity is making so many fun products these days! I’m always looking for Simplicity patterns because I’m new to sewing! Simplicity has been a name I have know all my life. From picking out new patterns from the catalog that my mom would then use to make so many of my dresses to my own foray into sewing in high school with my own copy of a Simplicity sewing book. Amazing to see all the new stuff from them. Love the rotary cutter and the bias tape maker, these would be a great tools for our Quilts for Nepal project at church. What a cool idea! 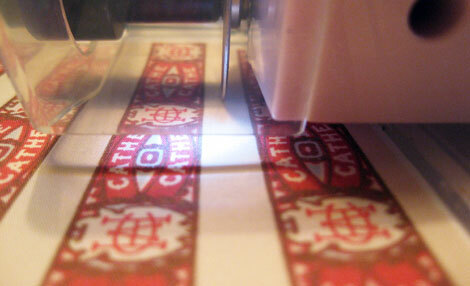 The Simplicity Rotary Cutter & Embosser saves so much time, what a brilliant invention. Interesting to say the least! Very curious what other things it can do. Will be fun to experiment with. I am new the sewing world and bias tape has been so hard for me..I have been drooling over these machines for sure! fingers crossed! awesome! I’m in awe of how awesome these products are. This would be a wonderful thing to win. It would make bias tape a pleasure to make. And a beautiful finished product with Cathe’s labels. The Simplicity Rotary Cutter & Embosser saves so much time, what a brilliant invention. Oh the Sew Easy patterns are so super! I ordered a couple today can’t wait to see. This bias maker is just amazing How many hours could I save? Many many many! I gotta have one! And the rotary cutter and embosser is just too cool to even imagine! I can’t ever get my strips straight! I love the variety of patterns. It’s great to dream about what to sew from their site. Hi Cathe, What a great giveaway. On my visit to the Simplicity site I noticed the lovely selection of twill tape and the colors – I think I need some to sew over when I make my open spine books. I sure did enjoy imagining owning and using some of those Cynthia Rowley tools. Way too cute! Love this project Cathe! I love Simplicity and these products are simply amazing! I love the trims, the felted gingerbread dangle trim has me thinking of Christmas possibilities. Thanks for such a generous giveaway! Cynthia Rowley Designer Tool Bag is on sale on the Simplicity website. Oh how cute! The website was great with lots of goodies for us crafters. I’ve got to make a baby quilt for a great-granddaughter due in 8 weeks. I’ve got the backing fabric ordered and the bias tape maker and rotary cutter would be a big help. Thanks for a chance to win and sharing your talents with us. Wow! Where have I been? I didn’t know they made so many ‘things’….I have trusted their patterns since I was a kid….and I *love* gadgets… I will definitely be trying some of the Simplicity ‘gadgets’ out! I have been eyeing that felting machine for a while now. I would like to try that out. Thanks for hosting a great contest. The Simplicity site seems like a great place to go for a huge assortment of items! I have a daughter who is making her own patterns and sewing and she would love this give away! What a phenomenal giveaway! I’ve been wanting one of their binding machines for so long – it would make my life so much easier!!! As far as their other products, I also really love the felting machine – so fun! I was so happy with the Simplicity website I signed up to receive several newsletters. Simplicity patterns have been my favorite choice for patterns for 45 years. I am a retired Family and Consumer Sciences teacher and just now have time to sew again recreationally. These products would be a wonderful incentive. 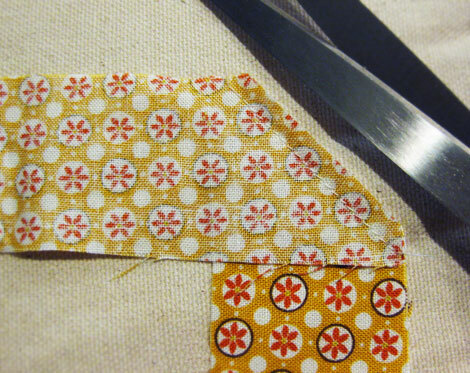 I’ve just started sewing more and just used bias tape for the first time this past week – I’m in love! I’ve never made my own since I dislike ironing/pressing so much, but boy would I love to! 🙂 I also cut so many straight lines, I’m loving the cutter! I’ve always loved Simplicity patterns. Recently I bought several pairs of Simplicity scissors. They’re beautiful and sturdy and work well. Love both machines and love Simplicity website!! I had no idea they had so many products – and I’m excited to find they sell out of print Simplicity patterns on their site. I’ve been disappointed more than once to discover a pattern I wanted was out of print. I also learned to sew on Simplicity patterns – many years ago. I love the bag patterns that Simplicty has…they are fabulous and easy to follow! I love Simplicity. Whenever I decide I want to sew something new I always go to Simplicity first to look at patterns. They are easy to follow and have modern style. I love Simplicity patterns and cut my teeth on their Sew Simple ones. I love the bias tape machine, what a fabulous idea. Thanks for sharing. Oh my! Pattern #2065 for the Tangled costume – so adorable! And I love the giant braid of yarn/hair! I have been wanting one of these bias tape makers SO MUCH!!! I love how they make it super easy to make bias tape out of any fabric you’d like. Oh, the yards of cute bias tape I’d make! Thanks for the chance to win! oooooh nice! I had seen the bias tape maker (I WANT!) but I hadn’t seen the Simplicity Rotary Cutter & Embosser! How awesome! 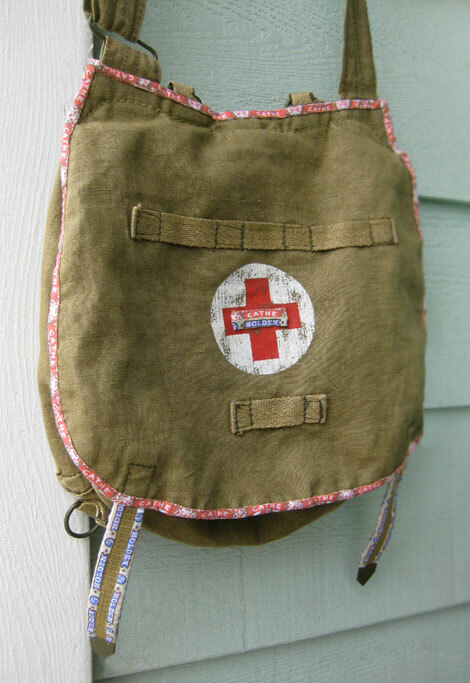 BTW the trim on your medic pouch is pretty great. They have such cute patterns! I’m really hoping I win this one. Love Simplicity’s Lisette patterns! And have been eyeing both the Bias Tape Maker and Rotary Cutter/Embosser @my local fabric shop : ) Terrific giveaway, thanks!! Growing up with my mother being a seamstress, and I myself doing crafts with sewing involved, Simplicity products are a common go-to product for our family. Dependable and consistent. The rotary cutter would be so helpful to both my mother and myself with all the trim work we do. Very cool! And Cathe, I love your blog. You have so many brilliant ideas! I discovered they have a machine that felts. The Bias Tape maker is great and your labels are the perfect finishing touch. I love to make my own bias tape. I’ve seen these Simplicity bias tape makers used for different projects before, but NOTHING as spectacular as what you did with your custom printed fabrics – AWESOME idea, and AWESOME product! How absolutely delightful! I wan to win this SO bad!! If I don’t those just might have to show up on my Christmas wish list!!! Hi there! Well, I had a look around the Simplicity site and I have to admit, I’m mystified as to why they have the site available for a US base, a UK base, a South African base, Euro and Australia, but NO Canada!!! Being in northern Alberta, I decided to use the US page, only to find that a lot of items aren’t available for shipping outside the contiguous US (which of course leaves out Alaska and Hawaii as well, but my issue here is Canada). Why are we so totally ignored here? I love to do my shopping online because I’m an hour and a half from any major center, and even then my choices are limited. So basically, of COURSE I would love to win one of these contests, but how about remembering the millions of us who live north of the 49th parallel??? Thanks for letting me vent (a bit). Patty S.
Well for goodness sake — I thought I could get through that Simplicity website without buying anything, but I couldn’t do it. I had to buy some of those out-of-print patterns. I love sewing supplies, patterns, gadgets. The rotary cutter and bias tape makers are so neat! Thank you for having the giveaway, I’d be thrilled to win either of those prizes! I’m easy…I’d love either one! I love Simplicity patterns for the fit and the classic styling-if I’m gonna take the time to make something, I want to be able to wear it for a while! I lost track of time looking at everything on the Simplicity website. The ribbons and trims are amazing. This is the one of the coolest giveaways you’ve had, Cathe! The rotary cutter is FAB! I love the bias tape maker too, so you would have one happy camper if you picked me to win either!! I have a long history with Simplicity, as I’ve illustrated their patterns for about 25 years now! Wow, I’m getting old. I do the fashion artwork for both the “Daisy Kingdom” licensed line, as well as the “Patty Reed Designs” line….lotsa ruffly, little girl things. Doing less and less of it than in the “old days”…it’s generally much cheaper to do photography, so that’s what the majority of the patterns feature. Their website is great, and they are constantly adding new, cool things. I can think of about a million things to do with the Simplicity trio for making bias tape! I love that Simplicity does so much more than patterns and so many of their notions can cross over into other crafts. ::thumbs up:: A long time lurker but this give-away made me post! i love the new simplicity patterns, especially the lisette line. these machines look amazing! i’d love winning either. what fun! I love my simplicity sewing machine and I liek to use their sewing patterns and modify them to make cool new projects. I love the bias tape maker. It would save my poor burnt fingers from Mr. Steam Iron! Have used Simplicity products for years and would love to have one of these machines! I can think of dozens of projects to use the original bias tape on!!! Oh – I just bought some simplicity scissors and I love them. Umm…this is awesome! I have never seen this in action before! Would love to try it out for myself- thanks so much for the chance! Love Simplicity patterns, I have a draw full of them that I’m constantly referring to. This bias tape maker would be such a cool tool to add to my arsenal! Love the Cynthia Rowley tools. And the cutter/embosser has great possibilities! The first thing I ever sewed was a Simplicity pattern dress. Almost 40 years later, I still use and love Simplicity products and patterns! i have wanted a bias tape maker FOREVER!!!!! THANK YOU! simplicity has done it again! i heart them! Awesome new products! Simplicity rocks! What wonderful gadgets. I would love to enter. I visited the Simplicity website and noticed you can even order out of print patterns. I may dust off the sewing machine and make something. Ooooh I hope I win! I use a lot of simplicity patterns, but their childrens patterns are by far my favorite! I love both the bias tape maker and the rotary cutter and would put either one to good use. I’m a quilt maker on Etsy, so the rotary cutter would be great for my business and my daughter makes yards and yards of homemade bias tape by hand for her apron business. This would make a great birthday gift for her this October. Oh, I hope I win!!! I would love to own one of these machines, actually both of them but we shouldn’t be selfish, huh’? lol These machines would save me uncountless hours in cutting and making all sizes of bias tapes, etc. Love , love to sew, papercraft, crochet, quilt, embroider, make rugs, paint, you name I have probably tried it and love it. I (heart) Simplicity and I have since I was twelve and used a Simplicity pattern to make my first garment. Thanks for the opportunity to win one of these fantastic machines. I have always liked Simplicity patterns. I’m glad I checked out their site, I didn’t know they sold out of print patterns! Pretty cool. I’ve been eyeing these two products for a while now. Thanks for the review – but now I want them more than ever. The Simplicity Bias Tape Maker is such a fantastic idea. I guess I need to look at more than just their patters! Thanks for reviewing and letting us all know about it. Are you serious?! There is a machine that is a DIY bias maker? I’m excited like the time I found out there was a DIY button machine. I would be in heaven if I had a tool like these. Sewing made easy, no joke! I am always trying out new Simplicity patterns. Maybe this year I’ll try their Halloween ones 🙂 Thanks for the chance to win! The Sew Simple patterns looks so easy – even I could do this. If I win this, maybe I can actually learn to quilt!!! My mom used Simplicity patterns, and I use Simplicity patterns. In fact, I still have some of the ones she would use. We love them! wow both machines look just fabulous and your bias tapes so super cute! I love the Simplicity Madeira metallic threads and those polka dot grosgrain ribbons. Thanks for the chance! I have been waiting to get my grubby paws on one of these! This is it!! Did you see the Cynthia Rowley tools? If that not enough to make me tackle my to do list, I don’t know what is. I did not know such machines existed for personal use! I love Simplicity products, my mom made me many dresses and Halloween costumes from their patterns. There is so much to look at on their site! But I do love the bias tape maker also. It is very cool. what a time saver! i do make my own bias tape from time to time but i’m sure i’d do it more with such a convenient tool! Girlfriend! u are my hero once again! And this is one cool tool…especially in your capable hands! oh my gosh! These would be so much fun to play with!! I love the Lisette patterns. Already have one, just need to make time! Love the Halloween deco trims on the simplicity site. The witch dangle, spider and bat pom poms are awesome. I would love those for my decorations this year. thanks for the chance to win custom bias tape maker and embosser blog candy. I remember making matching bias tape for the costumes I used to make when I worked in the theatre. This would have made my job so much easier! That felting machine looks really cool! Loves these two products. I have never seen them before but would like to have a try at them and to make some great gifts with them. I have always been a fan of Simplicity, especially the Simplicity patterns. I would love to be able to make my own bias tape without a lot of cutting. That’s my least favorite part of making it. I also love Simplicity sewing patterns for girls. They have the cutest patterns !!! Love the bias tape maker. Love the fact that Simplicity keeps making it easier to be creative. I am swooning over your bias tape. Lovely. Did you know they have a yarn winder? I did not know that. It makes balls of yarn. Really. I may need one. Since I just recently got hooked on loom knitting I would like to say that I like all the looms on the Simplicity site. i never knew simplicity made anything but sewing patterns! these machines look like they’d be a lot of fun to use….and maybe i’d finally try to use bias tape. Simplicity? I love the patterns, I love their felting machine, and these are simply brilliant! Go on Simplicity, keep making our crafting lives better. I love Simplicity’s patterns! They’re easy enough for me to follow despite being interrupted a million times by my one year old so what’s not to love! I LOVE the bias tape maker! I’ve been wanting it for ages now! I’m trying to save up for it, but there are so many neat sewing things that I want too! I love all things Simplicity! OH WOW! both of these machines are genius!! I have the regular bias tape maker and the singed fingertips to prove it! I think that whoever created these amazing tools deserves a huge hug. I LOVE making my own bias tape, but oi is it a process – either of these tools will expedite that process!! Not to mention all the other things one can do with that rotary cutter! swoon! I love the simplicity children’s patterns! My daughter wore 2 flower girl dresses made from the same simplicity pattern and my grandmother made a baptismal gown for my youngest two from a Simplicity pattern as well. I would love to win this – thank you! I love this… I have been a paper crafter for a long time, and for my birthday my Mom is buying me a sewing machine.. so I’m re-learning sewing, and making your own bias tape… I told my Grannie about this, and she went on her rant about how she use to make her own, and would love to have had this in her days of sewing… she made everything, I hope to get up to that caliber someday… thanks for opening up my eyes, and me learning something new…. I love that this machine exists! I’ve made bias tape by hand for years, and I love the idea of having a much simpler way to make it. I also saw a ball-winder on the simplicity site that I have to buy – didn’t know they sold those, too! I hope I didn’t leave an earlier comment. My meds make me forget… sorry if I did. So – I am thrilled that the Project Runway trims are available on the website! That is so cool! Simplicity has always been my “go to” for fabric and patterns. Still is. The yarn winder looks cool too but the bias maker would be my first pick!! Simplicity certainly has a great site. and as for these machines. WOW!! sooo cool. Wow, I can think of so many cool uses for these machines. Might just have to buy them if I don’t win. The Simplicity Bias Tape Maker is on my top 5 wish list. I love the idea of my own bias tape to match any project! the simplicity bias tape maker and rotary cutter & embosser are terrific! My mind is in overdrive right now thinking about all the things that could be created if I had this, I am always looking for ways to embellish not only sewing projects but altered art and scrapbooking as well, I loved looking at your incredible projects. How exciting would it be to win this! It would be amazing! Just got home from my quilting class, the bias tape maker would have been very nice to help me with my quit I’m learning to make! And I just saw the new Halloween Pattern from Simplicity, it about time to start making the costume’s for the family! The Cynthia Rowley Designer Tool Sets are too cute. I have discovered that I like to use bias tape and I don’t like to make it. This machine would be awesome to use for my projects! I have always thought of Simplicity as just patterns, I had no idea that there was sooooo much to offer; great web site. Love the bias tape maker and the cutter would make it so easy, no worries about fabric slipping around as with a traditional cutter. Wow! I had no idea Simplicity had a website! I am really amazed by the patterns and will need to try out one of those fleece pillows for my kids. I never have time to sit with my little ones while shopping and this website is a great tool to see the patterns at home! Great ideas, Great patterns…So awesome! I adore the Cynthia Rowley patterns. They are current, and fashion forward! I would LOVE to win either one. Maybe, I’d not be so lazy and make bias tape for a change…lol! I love my Simplicity bias tape maker. I love being able to make my own bias tape, it opens up so many possiblities. Love the projects that you have made with yours. I’m excited to find pattern 3723! I have been looking for an adult bonnet pattern. Having sewed for the last umpteen (50) years I can truthfully say Simplicity patterns were the ones I always went to for up to date style and ease of use. Simplicity has always got great patterns especially now that they have Little Lisette patterns as well. Thanks for the free printables, I love how you packaged the bias tape up. What a fantastic machine! I’ve sewn with Simplicity forever, and now this! Thank you so much for the chance to win one and I adore how you made your own fabric then bias tape!!!! Awesome!! Thanks so much for sharing the process with us! 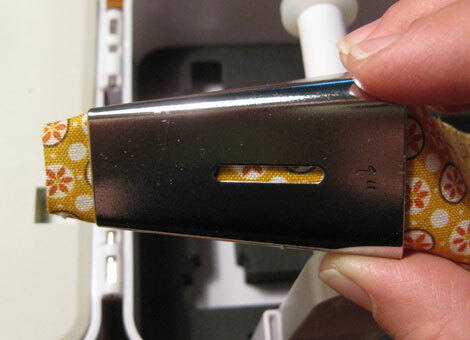 Oh, I didn’t know that Simplicity carried Omni-Glide Sewing Machine Luggage … it’s very cool! 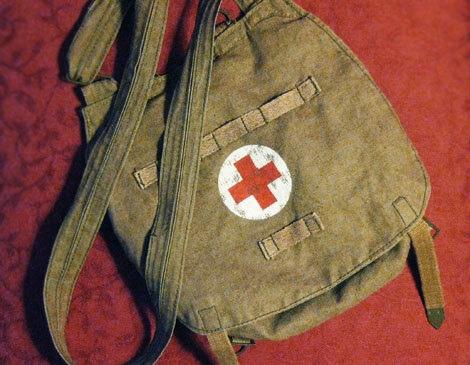 BTW, that medic bag is way too cute! Simplicity has always been a name I could trust and the Bias Taper Maker is a dream come true. Having matching bias tape trim will really give garments a professional look. I absolutely adore this bias tape maker. Now I can take my favorite fabrics and turn them into coordinating bias tape! Both of these tools look like they would be so much fun to use. I’ve never even made bias tape before! I have a quilt designed in my head. I just need to get over my beginner’s fear and attempt it. The Simplicity patters are really fun. And as a knitter I can never have enough little knitting tools and needles. Those are really great ways to make use of the machines. The felting machine looks cool too. Oh my goodness..I love the Tacony Scissors! SOOOO cute! Thanks for the chance to enter! 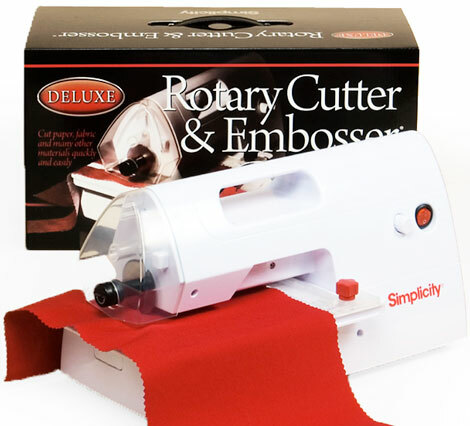 The Simplicity rotary cutter and embosser would be perfect for my sewing and crafting hobby – what an awesome machine! Both of the products would save my mom from making my bias tape! I love Simplicity. Patterns are on sale this weekend at Joann’s and I have them all picked out. Thinking of dressing up this halloween for the first time…little one is a girl pirate with a costume from Disneyland. I will make a matching mommy version. Just can’t decide which of the three Simplicity patterns to go with. what an awesome giveaway! i have to say that my favorite thing on their website is the pgm pro dress forms–i had no idea they were paired up! i have a beautiful pgm pro dress form and don’t know what i’d do without it. but now i have a hankerin for that bias tape maker! What a great giveaway! This fall I start a beginners quilting course and I see that they offer lots of tips and techniques, should be very useful. Oh wow, I’d love to use this to make cool bias tape instead of the same old set of boring colors! Thanks for the opportunity! I love the Cigar Label Bias Tape that you made! Just checked out the Simplicity site, the Cynthia Rowley items are just too cute for words. Oh I’d love to win the bias tape maker, how fun! I haven’t looked at patterns for ages and came across the Amazing Fit line on their website. I’m excited to try them out and see if they work for me with less alterations than I usually have to make! Wow! I had always wondered how the Simplicity bias tape maker worked…thanks for showing it’s capabilities!I can see how the two products make life a lot easier. Now here’s to hoping I win one for my sewing nook! Just think of the time to be saved by using these machines, especially with the cutter. I’d love to own it! I love the bias tape on the simplicity website! would be awesome to even be able to make this myself! wuuhuuu! Wow! Selfmade bias tape, without scorched fingertips!! I bet it’s a grat timesaver too! I would love to win one!! Btw, I just love the Misses’dresses pattern!! I like what I see and I see what I like! I’m a newby to sewing and had my first attempt at cutting my own bias tape….. After 3 goes and a few re-irons I got there. VERY happy to see simplicity do more than patterns. I must say their patterns do make for easy sewing for beginners like me. Goo job on the giveaway! I make my own bias tape but such gadget would really make my life easier. Thanks for the great giveaway! I love Simplicity patterns, especially the Project Runway series. What a great blog post. I’ve been eying these machines, and this is the best review of them I have seen! Looking at the simplicity site, the machine section is AWESOME. Hello, felting machine??? Yummo! Simplicity do such a wonderful range of goodies ………….. I visited the Simplicity website and couldn’t believe all the products they have! I even “liked” them on FB, I was so impressed. I commented there, as I will here, that I was recently trying to do some decluttering. I have Simplicity patterns that are 40-50 years old and, even though they probably wouldn’t fit, I can’t get rid of them. They really were my go-to choice when I was learning to sew, which has been a lifetime hobby. Oh, to think of all the bias tape I’ve made the old-fashioned way and all the cutting I’ve done of strips for all sorts of projects…. Thanks for showing us some new products and letting us play along in hopes of winning. Your bias tapes are beautiful, BTW. The Simplicity rotary cutter & embosser looks so cool, would love to try it out (especially now that I’m expanding my craft room)! I would love to win either of these great prizes! The bias tape maker is great. The selection in the store is so limited. I cannot get over these products! It is so amazing what they are making for the home crafter. 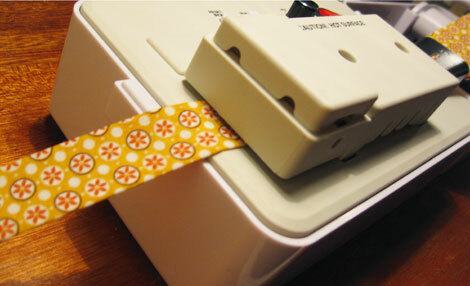 I will be getting my Mom the Simplicity bias tape maker for Christmas (and borrowing it often)! Wow- how did I not know this site existed/? I am a straight-line kind of sewer… but this mau ispire me. I love the ribbon section. Either one of these machines would be amazing to have!! Please enter me. I learned to sew using Simplicity patterns! Always loved them. And, oh how I would love those machines. I’d never used boring, pre-made bias tape again. Ooh, I’d love to win one of these! I love simplicity patterns–i have a darling one for dog beds. It includes a little sleep sack, a covered bed, a standard bed and a doggie ramp. So cute! I’ve grown up using Simplicity patterns and notions. Great patterns, sturdy reliable notions and now super fun ways to make your sewing easier….HEAVEN! How wonderful would it be to be able to avoid the bias tube maker and blazin hot iron, not to mention the manual rotary cutter. Crossing my fingers AND TOES! wow what a great giveaway!! i’ve made my own bias tape before and this thing would certainly speed it up like 10 speeds!! =) love your bag!!! Love the cutting/embossing machine, can just imagine all the bazillion things it could do! I’ve always tended to Simplicity patterns, think I got that from my mother 🙂 She would love all the things that are available now. Thanks for this great giveaway. Wow, could I use one of these! I love Simplicity patterns! Thanks for the opportunity to win! Love these tools, love the patterns. How fun is this! I have to say, I visited their site and immediately teared up seeing the “we remember”. My husband is deployed and I hadn’t put thought in to it being the 10 year anniversary next month of Sept 11th. Very tasteful way to call for remembrance. I was just looking at the simplicity website yesterday. I can’t believe I missed seeing this cool tool! wow that would make life alot easier! Simplicity make me drool all over myself! So much cool stuff. The bias tape machine is on my Christmas list but I hope I don’t have to wait that long!!! hint hint! Imagine how much $ I could save and how many cool Christmas presents I could make if I had it BEFORE Christmas! Simplicity has been part of my creative life from a very young age. I’m so glad they are still making it fun and easy to be creative. I have always love Simplicity. I love visiting the Simplicity site, their patterns are so awesome and I love that I can find really cute trims on their site to use not just on my clothes but also for my crafting. Thanks for sharing all the gorgeous tape you made! I so would love to win! I have my fingers crossed I win! Thanks for the chance! I would love to win either product. Wow, what an incredible giveaway. I am a bias tape addict and I am so crossing my fingers and toes for this!!! Love the Simplicity products and what a Fantastic giveaway. Would dearly love to win this machine and to be able to make my own bias tape. love – love – love the Simplicity site! They have such great products. Love, love, love, Bias Tape! It just makes that special thing to any sewing project. Great giveaway! I love simplicity’s new rotary cutter and embosser! I am making crochet bags and I can envision ways to embellish them with this new and easy tool!!!!!!! how exciting!!!! This is amazing! If I don’t win, I’m still gonna buy one! Thanks for such a great tute. My mind is overflowing w/ craftiness! I love love love the bias tape maker! Being new to quilting, the parti hate most is ironing that tape…. Burning of the fingers much? Haha. I love all the choices of patterns on the simplicity site! You can always find something to make! How great to be able to make my own bias tape! The cutter is also something I would use all the time!! Thanks for the giveaway! I can’t wait to try out both machines I have all these ends of material that my Mom had and I don’t want to get rid of them as My late Mother used them for many different things. Binding around Quilts and many other things. My hands and time won’t allow me to do it her way but with these machines I would beale to keep the work she helped learn me keep going into the future. I have been using Simplicity since iwas a little girl and i love it when i go to a shop that has a yard goods department and lots of new patterns. Thank you Simplicity for helping me out threw all the years. The rotary cutter and bias tape maker is awesome! This will definitely simplify the process of making matching bias tape for sewing projects. Simplicity has outdone themselves in creating this machine. 🙂 I love Simplicity patterns. Since I started sewing in Junior High, their patterns have always been my favourite, not only for the ease of sewing but with their fashionable designs. Thank you for the opportunity to win this wonderful product. I have been cutting up old Tshirts and crocheting the strips into things. Because of my rheumatoid arthritis it is becoming to big of a job for me so I have been getting my 11 year old daughter to help. We were just last night saying that there has to be some kind of a machine that could cut these strips for me. Low and Behold. The Symplicity Delux Rotary Cutter and Embosser giveaway was on craft gossip this moring. I have never seen this before. Its so cool i would love to have one. I’m always looking for new ways to incorporate my love for fabric into my love for card making! What great tools, and to know that they are offered by Simplicity! A trusted brand by my grandmother, mother, my sister and me. Love how these tools can make my sewing simpler! Thanks for offering this amazing opportunity! Pretty much everything I’ve ever sewn for my kids has been from a Simplicity pattern. <3 them! Always loved Simplicity patterns, but have been eyeing the bias tape maker for a while. Didn’t even know about the rotary cutter. WOW, so many neat products! Oh my goodness – I could use this these machines for so many things. The Bias Tape machine has been on my list for a long time. Just love their patterns and I’d love to have one of their dress forms too. amazing!! i went to the simplicity website and i am torn! i would love to have the sidewinder for my regular sewing but the felting machine stole my heart right away!! thank you for the chance to win and for introducing me to all kinds of cool things!! your tapes and bag are so cute and clever!!! I am new to sewing, but am becoming addicted so quickly just at the thought of all the beautiful creations I can make!! Every time I see a new project I would like to undertake, it usually requires bias tape and I am usually always needing to purchase some as I am just learning how to make it myself. So with that said I would love to win a Simplicity Prize! Simplicity has so many wonderful patterns and I am working towards buying a dressform from them too!!! Oh, these machines look like so much fun. I been using Simplicity patterns since I took home ec (long, long ago) and they are still going strong. I thought the out of print patterns are fun. I do enjoy those Simplicity patterns! I love Simplicity’s patterns. I’ve used a number of them – would especially like to sew anything from their Retro 1940’s patterns. I would LOVE LOVE LOVE to win the rotary cutter but the bias tape maker would be awesome too! Those bias tape maker tips are AMAZING. I LOVE them. The bias tape maker is brilliant. I’ve always been a huge fan of Simplicity patterns and would love to have either of these machines, too fun! Well, if that’s not the niftiest thing EVER! I’ve been a big fan of Simplicity since waaay back when. My sewing book/bible is a Simplicity! I love that they carry the Ott lights–I need to get one of those stat! Thanks for the chance to win such lovelies! I had never been to the Simplicity website before and had fun looking around. They have the cutest 60’s pattern for a women’s suit! I want one now! These machines are AWESOME! Thanks for the giveaway! I love the Disney Doodle shirts and other items at Creative Play. Keep kids creating! It’s so important to teach children there is more to life besides earning money and spending money. Simplicity is sewing at its best! What a wonderful way to use printable fabric! The rotary cutter with all the attachments and pieces looks so useful. The bias tape maker looks like fun and I wouldn’t have to stop a project while I wait for my local stores to restock the colors I need in bias tape. Thanks so much for the chance to win. Be still my heart! I would so love to win this! I didn’t even know these things existed. Losing everything to katrina, makes me appreciate the things in life that make it easy! Thanks Simplicity! I have always loved Simplicty patterns, but now I know the bias tape maker needs to go on my wish list! This is an awesome machine, would make my life so much easier! I’ve always loved Simplicity sewing patterns and the costumes for Halloween are so cute. I’d love to win this prize…could really use it! Thanks for hosting. Oh thats a great tool. i would love to use this cutter or this tape maker for my projects. i just watched some videos from simplicity products and think they are a good help. Spent some time looking around the Simplicity site. I’m particularly attracted to the Deluxe Felting Machine. And I like the short tutorial for the product. Thanks. This tool definitely puts the SIMPLE in Simplicity! Such trusted patterns and tools, you really can’t go wrong! Wow they have so many great products there! Making bias tape is so boring! I would love to get this awesome machine! Your bias tape look great! I love these machines! I hate making bias tape by hand so this machine is a dream! Simplicity is the best! I love Simplicity patterns! I’ve made several in the past and have always been pleased with the results. I sew a lot of projects with bias tape and while the bias tape maker would make my life a lot easier, if I won I think I would have to give it to my mom (the quilter) for her birthday next month. I know she would love either one of these products. oohh I hope I win. I love the simplicity patterns and would love to make my own bias tape too. Both of the machines have INCREDIBLE potential and your projects as always are amazing! Thanks for the giveaway! I am so in love with these two products and I haven’t eve tried them yet! oh… the things I could make with one… but with both the possibilities are endless. I have to say Simplicity sure know how to please a sewer! They some of the best gadgets a crafter/sewer could ever want. So please let me win just one I beg of you. I enter these giveaways all the time with the hopes of winning once, but this time I feel like it’s the Superbowl of giveaways!. Wow! The bias tape maker looks like a great product! When I was 16 and started sewing from patterns I quickly learned Simplicity patterns were the best…22 years later and I still feel that way! Oh my! Both of those gadgets look awesome. How fantastic would it be to have one at my disposal? 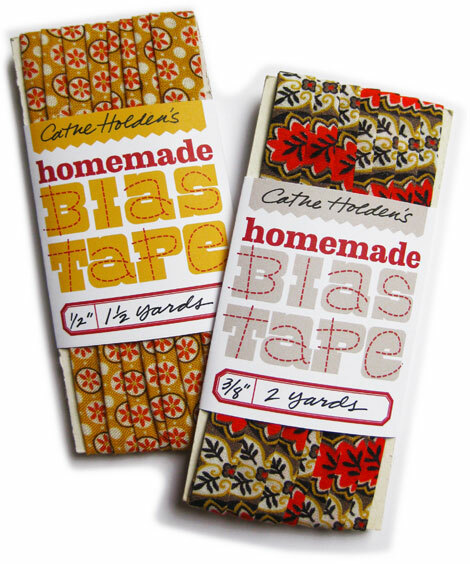 I would be beside myself and my whole house would be adorned with bias tape! ooooohhhh I’ve been looking for a deal on one of these and i’m just starting to learn how to sew quilts. my sister-in-law and I have been learning how to sew together. it seems to be a dying art form in our generation. But this would be such a huge help!!! I LOVE the simplicity Apron patterns!!! they are quick and easy for beginners but look so gosh darn cute on! who knew that there is so much awesomeness on the Simplicity website?! Obviously not I! What a great give away – I must get back to Simplicity.com to continue snooping around! I’ve been sewing on a simplicity machine since I was 8 years old. Even after I was gifted an super fancy digital brother sewing machine … I stuck with my simplicity. So I would LOVE to be able to add two new products to the family. thanks for the AWESOME giveaway and I hope I win! The Simplicity Bias Tape Maker looks amazing! I have not seen this before. Thanks for sharing the review and your great ideas! Wow, what a simply wonderful sewing gadget! 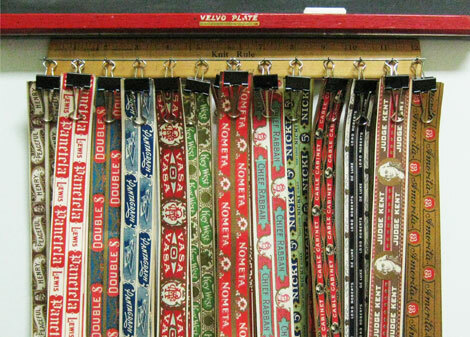 I would love to have something in my sewing arsenal that would do bias out of my scraps and make labels, etc. I had an old Simplicity sewing machine that sewed for hundreds of miles and have always loved their patterns. I know these new machines will be just as much fun to use! What a wonderful giveaway. I have looked at these bias tape makers before and wondered if I would really use if that much? Now after seeing this great bag redo I can see a world of possibilites! The rotary cutter would be a great help to my arthritic hands. Simplicity has always made great products. I can remember learning to sew and using Simplicity patterns, because they were the most straight forward and easy to use. Thank you for the opportunity to win this really great prize and I also have to thank you for your tutorial on making a blog button. I made mine using that tutorial! The Simplicity site has a great selection of tools under the Craft section. Not to mention these machines look like fun. My mom and grandma have been making Simplicity patterns for as long as I can remember! They have of course expanded so much that my grandma would be blown away! I love the patterns. I am always in the middle of sewing some dress pattern that I saw ans love. I would love to make my own bias tape for all of the project that I am up to. A lot of my favorite patterns -the ones I keep coming back to, whenever I have some fabric and am not sure what to do with it- are Simplicity! So much to see on the Simplicity site! Ideas and patterns and machines, oh my! I grew up with Simplicity patterns, and continue to love the brand. I am also thrilled to think that I might win one of those great machines! I love the thought of using either of them!!! I love the items you are giving away, but after going to the Simplicity web-site I have to comment on the Project Runway trims. My daughter and I started watching Project Runway and we really enjoy it. The show has inspired her to create clothes for her dolls. I am going to get her some of the trims for her birthday so she can continue her fashion designing. Simplicity makes the best little sewing companions EVER!!! Thank you for the giveaway! I’d love to win these!!! This is definently the coolest thing I’ve seen, hope I win, would love to have this! I am a newer to sewing and really like how many different patterns they have to offer. This would help me so much if I won seeing that I am making a quilt right now! OH BE STILL MY LITTLE HEART!!!!! I have been DYING to get BOTH of these, buy alas they are out of my budget. I jave been sewing like a mad woman and would love to label my clothes, etc. But I NEED a bias tape maker. I hate ironing it by hand, but don’t care for the store bought type as much as home made matchy matchy ones. Thanks for being sooooo SOO generous!!!! I Love the charming bias tapes at Simplicity! I have the 3971 Misses’ & Men’s Plus Size Sleepwear pattern. It’s fun making “comfy” pants in many different fabrics. This would make my life sew much easier 😉 I love bias tape. Amazing how a piece of folded fabric strip can be so awesome! Seriously? What I would do with that bias tape maker! LOVE. Simplicity is always the first pattern book I turn to at the fabric store. I love simplicity patterns, they are the first ones I go to for any sewing projects! I have seen the boxes for these machines in the store, but your demo has really opened my eyes to the possibilities for their use. For a charity project I am involved with(Dress a Girl Around the World)at church, we use yards and yards of bias tape, some is donated, but most of it made very slowly by hand. This bias tape maker would be such a time and cost saver. Thanks for the chance to win one! I love all the Simplicity patterns. I made all of my girls clothing and now working on my 7 granddaughters dresses!! I have used Simplicity patterns for years and my fashion design student daughter is coveting one of their sewing mannequins. Given that I was born on August 20th I am hoping the birthday fairies will work some kind of magic. Be blessed and thank you Simplicity and Cathe for the chance to win something SO fun. What a neat machine! I make my own bias tape and this would be such a time saver. I eneded up spending quite alot of time on the Simplicity site and for some reason I was drawn to the different types of cording. I don’t even know what I would use it for but I will think of something! You have no idea how much I want these Simplicity machines! I have been lusting after them for a while now and would LOVE to win them! I love Simplicity patterns, and their Halloween trims are to die for!!! What a fabulous giveaway! Thanks! When I started sewing way back when, with the Simplicity patterns none the less, we only had the basic sewing machines. I remember when the over-locker came out for commercial use, what an awesome invention! Now I look at these machines and I can’t believe it, I have to have them! Simple-City. That’s how we used to say the company name, lol, with all the new machines, that name kind of makes even more sense! Back in the day my best friend Erin was an 8th grade sewing diva! She seriously could sew anything! The Simplicity company came to our school to promote their patterns and give a fashion show, of course Erin was asked to model the clothes *she* had made! Anywho, let’s just say I have been a fan of Simplicity since the early 70s! Oh my gravy, that bias machine is the best! I love all of the Simplicity products, but I especially like their Project Runway affiliated line. Great giveaway! I love the Simplicity binding but would love to make my own. The Rotary cutter looks awesome too and would be great to try. I’ve been interested in both machines for a long time, either would be a great tool, but I’m partial to that rotary cutter! LOL. I have been looking for some parsons chair cover patterns for awhile, and I checked out the Simplicity site and found one 🙂 Might be grabbing it soon for my dining room chair covers. Thanks! 🙂 Now, if I can just win one of those great machines! 🙂 Thanks for the chance! I have been making it with scissors and an iron, would do a happy dance for one of these machines! I didn’t know Simplicity offered so many more items than just patterns. Would love to have a dress form. That bias tape maker looks like an amazing time saver! Last week I spent the whole week making bias tape the “old fashioned” way. It took forever! Aw, wow! I’ve been drooling over the bias tape maker and the rotary cutter/embosser for almost a year now! Another thing I’m eyeing up is one of those sidewinders. I’m thinking all three need to be a part of my family! Oh…the Disney costume patterns are so cool – my girls would love those dresses and how fun to make them myself! Most perfect things ever! I love Simplicity, every time a friend of mine starts learning how to use I set them up with Simplicity products! They even have a Deluxe Felting Machine. They have anything and everything you would want to make your sewing life easier. Excuse me while I go look some more. Thanks for the giveaway. My sister and I use the patterns all the time! They are pretty inexpensive and great! I grew up with Simplicity products and was always encourage by the projects I was able to complete because they had such a good variety of easy to follow, yet attractive things for me to make. I am a serious tool junkie and I have had my eye on both these products for some time so I would love to win either one. Thanks for the giveaway. Love the Simplicity site! I hear they’ll be doing downloads directly soon:) Sooo want either of these gadgets! My first solo sewing project was a Simplicity A-line dress that I added (battery-pack-powered) twinkle lights to for the Christmas dance in grade nine. I was the talk of the town. Every time I pass the Simplicity patterns, I smile. They always make me think of the possibility of my next project! i love their patterns! They are actually sweet people, too! I was looking for patterns by a certain designer and they weren’t at the store. I had emailed the designer and they actually looked for a store in my area that had the patterns since the one I normally go to didnt have them. Anyway, they found a store and for as thank you, they sent me a book/magazine. I thought that was nice. I’m like a kid in a candy store with all the neat tools there are! I can’t decide which I’d love more. I like to make photo quilts, which start with at least a couple thousand one to 2 inch squares – that rotary cutter would be GOLDEN to help with all that prep! And to think, back in ‘my day’ we only had scissors. How archaic! 🙂 But I really have my eye on that bias tape maker, too. Last week my first granddaughter was born, and the next day I went nuts and bought enough Simplicity patterns to clothe her until she’s about 6. Seriously, I hit a sale and bought that many adorable patterns. Just think how much fun it would be to have custom trim on those girly things! Either of those machines would look great on my sewing table right next to my Simplicity Quilter’s Classic sewing machine! Simplicity just seems to know what we want. Thank you for this giveaway! I’ve always loved how easy their patterns are to follow. Besides being an awesome giveaway, this just reminded me that I have a new Simplicity pattern (#2286) sitting at home that I haven’t broken out. So, thanks! oh – pick me. so useful for my little etsy shop. I will say the New Lissette patterns are darn cute. I own a couple but I haven’t had a chance to use them – but soon! OMG — I need one of these machines. And I love the labels you made for bias tape. So cute. I checked out Simplicity — I think I’ll be spending a little time there. Lots of fun “needful things”. i have wanted a simplicity bias tape maker for soooo long! would love them!! So many wonderful patterns and things from Simplicity! I could spend hours dreaming about all the things I want to make! Oh my, I love the cute Cynthia Rowley tools! I went to Simplicity site and I thought I went to Heaven. I spent an hour just looking at all of the stuff. I didn’t know that they sold all the stuff I saw. The winders and cutters. I fell in love with their site. Thank you for such a wonderful giveaway I just hope that I win. Holy-Hot-Lasagna, Batman! That’s a simply amazing machine! I love the patterns you chose for your bag. Good work. One of the things I love so much about your site is that you’re constantly introducing us to new things! I have such a positive association with Simplicity from watching my grandmother make clothes over the years, but I had no idea they made newfangled products like these. I’d be thrilled to win! I’m over at Simplicity’s website at least every other day, it seems, drooling over their patterns and wonderous products. I have been admiring the bias tape maker especially for some time. It gets so old making it by hand (I don’t even have one of those metal contraptions to drag over my strips – I’m doing it ALL by hand). I have loved Simplicity patterns for years. Especially the costume ones. I have recently been adding bias tape to lots of my projects because I love the “pop” that it adds. I use a little handheld cheap bias tape maker and I have been coveting the Simplicity Bias Tape maker for quite some time. Fingers crossed!!!! 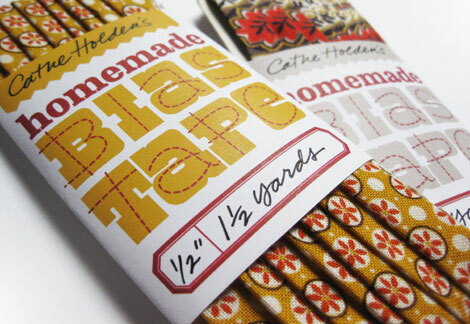 Oh my goodness… I didn’t know even know that there were such things as bias tape makers! Amazing! Clearly Simplicity is making an attempt to make my life simpler! Wow! What a fantastic giveaway! I quite fancy either the Rotary Cutter or the Bias Tape Maker. The Deluxe Felting Machine is pretty awesome, too! Wow, what a great, great, great giveaway! I would love to win the bias maker! It’s such a help! And things are looking so much nicer and friendlier with handmade bias! I didn’t know about the simplicity site befor but I really like the Cynthia Rowley patterns! I love your bias tape, and would love to win one of these tools. Simplicity has such great patterns! Beautiful and cool, both! I had no idea Simplicity site had so much, even kids furniture. I grew up with my Mum, Auntie and then later, myself using Simplicity patterns. They are a part of my home life! Id love iether of the machines frankly but am thrilled to have found the website too! I had no idea Simplicity had an embellisher now and intend to trawl through their old patterns as well……off to et a cupper and then browse away! Hope being in the Uk doesnt stop my name being in the ‘draw hat’! Oh the possibilities of the rotary cutter and embosser! The fun that tool would be! I love Simplicity products, but their variety of trim and ribbon makes creative imagination run wild…(for one can never have enough trim or ribbon..)Thanks for the fun giveaway and delightful ideas you share! Your medical bag was simply transformed in probably record time. Bravo! Both of these items, the Simplicity Deluxe Rotary Cutter and Embosser and the Simplicity Bias Tape Maker enables anyone to put their own stamp of creativity on projects AND without sacrificing valuable time. If I don’t win either of these, the page is bookmarked as we speak so I can show Santa what I want for Christmas this year! Thanks for demonstrating these wonderful products! I had no idea that there were so many products available on the Simplicity Web site. (Thought it was all sewing patterns!) I think my favorites might be the wide variety of trims and ribbons. Thanks so much for introducing me to such a great resource. And also thanks to you and Simplicity for the chance to win these amazing prizes. Good luck to us all! My sister would be in Heaven if she had this. I too must admit I only thought Simplicity did patterns. I am having toomuch fun looking at their products! I make my own bias tape the old fashion way: with the iron and metal take maker. I can tell it’s not the straightest so this machine would be a whole lot easier and nicer! Hope I win! Thanks! I have a tin in my craft closet full of change. Everynight I clean out my wallet and throw my change in the tin. I paid for a very good used sewing machine this way, but it took forever! This round of change is being saved for the Simplicity Rotary Cutter. I started using Simplicity patterns when I learned to sew when I was eight. I love the new Lisette patterns, I have one but I can always use more. I’m so glad you posted about these tools, I have not seen them before and your recommendation is a great endorsement. I spent some time at the website and can’t believe all the wonderful things available! I’ll be planning some holiday crafts and looking at the site for supplies and inspiration! Thanks, Cathe! A dream come true would to own this fabulous machine! Oh the things I have in mind–+++++Uor website is so much fun to read. Wow wow wow, what a wowderful prize, I absolutely love “Simplicity Patterns”. I have used them all my life. I was about 10 when I started dress making and it was always Simplicity patterns I used because I understood them, If I used any of the others I just didn’t know what to do. Now many many years later I still use them. So I really really would like to win this prize. Thankyou so much for this chance to win. I love love love Madeira threads! It’s the only kind I use with my brand new sewing machine. What a great giveaway! I have an assortment of Simplicity patterns, but I never tried their other products. My Oh My! What wonderful machines you have shared with us. I had no idea there was such crafty machines as that. Thank you for giving us the opportunity to have one of these little gems. 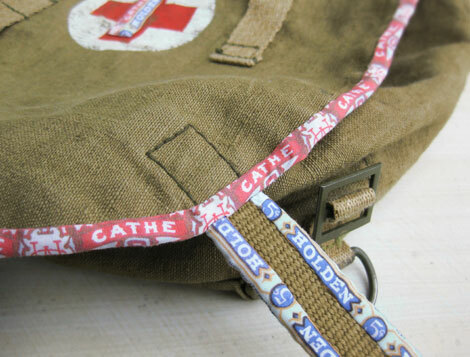 Just love the cigar band tape you made and applied to your wonderful bag. Simplicity patterns sure have been around for along time and I have used their patterns for a long, long time. I have some wonderful old patterns from back in the late 50’s and early 60’s. I have held on to them and have made some great clothes again from them in this current century. Now that Deluxe Felting Machine sure looks like it would be a fun little machine to play with as well. Never enough time in a day for all we want to do! Thanks Cathe, for the great opportunity. I look at the bias tape maker longingly every time I go to JoAnns. I would love to win one- after seeing all of your creativity with it, I am imagining all of the fun stuff to do. And the Cynthia Rowley stuff over at the Simplicity website? So stinking cute. I want it all. BAH! What I wouldn’t do with that Rotary Cutter/Embosser. OR the Bias Tape Maker!!! I’m getting married next summer and I’ve got tons of DIY projects underway that would SO be simplified by either of these machines! Even if I’m not lucky enough to take one of these bad boys home, I am completely indebted to this post for introducing me to Simplicity’s website. Seriously, I’m in love, and will be spending the next few hours scouring this site for ideas. Thanks Cathe! Awesome giveaway! I would love a bias tape maker I just can’t stop myself from spending all my money on fabrics. I’m a big fan of Project Runway patterns at Simplicity and I just came across Zipper rossettes, very cute! I didn’t realize Drew was featured on the Simplicity site for their knitting & crocheting! I’ll have to investigate that site more. Thanks for the giveaway! I love all their Cynthia Rowley stuff, but my tools need a cute bag dammitt! Wow….The machines look fantastic….and seem easy to use. The bias tape maker would solve my currant need for custom bias tape for a purse project. Thank you for the chance to win! I love simplicity. I have eyed the bias tape maker and am new to the rotary cutter and embosser. Both are amazingly useful tools. Would love to be able to use them. The simplicity patterns are always great gotos if looking for great basic non complicated sewing. The machine makes the cutest bias tape! I didn’t even know there was such a thing. I love everything about Simplicity and have been a member of the Simplicity Creative Group for some time. The website offers patterns – current and out of print, free projects and accessory items. I really enjoy Drew and am pleased that Simplicity realizes that many of us are mulit-crafters and helps us with sewing, knitting, crocheting and crafting. Of course the Rotary Cutter and Bias Tape Maker would make my sewing projects sooooo much easier and look more finished. I just saw these yesterday at my big box craft store. I had no idea what they did and how easy they were. Simplicity=Simplicity. Oh wow! I once had a genius idea to make my own patchwork bias tape. I think I might have made it through 3 yards before I got tired of all that ironing. Simplicity is genius for coming up with a machine to do this, I need one asap! I have sewed with Simplicity patterns for over 40 years and still appreciate the clear concise directions. Well named company! That sewing machine luggage on the Simplicity website is fantastic – I didn’t realise such a thing existed…very useful for taking your machine to classes. I’m also very taken with that bias binding contraption – and your cigar box trim is terrific. I’m not sure that we have cotton you can put through a printer in my neck of the woods, but I’ll certainly be looking out for some. Just looking at the website makes me want to sit down at my sewing machine instead of the computer. I love their patterns and enjoy looking at them online. I love that Simplicity has the Sew Simple patterns for less experienced people. Thanks! I just love the bias tape maker, so vry handy and cool! And the fabric, i love fabrid almost as much as paper! 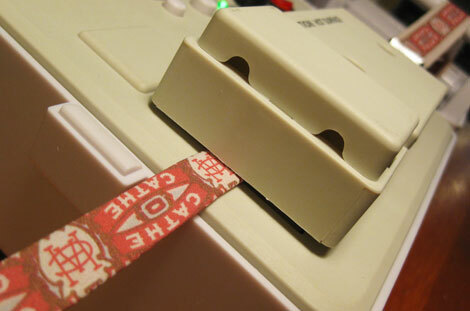 I hate cutting strips and I had no idea there was a machine that did it for you, so awesome!!! I love the sewing machine luggage. I would also love to receive either the cutter and embosser or the bias tape maker. 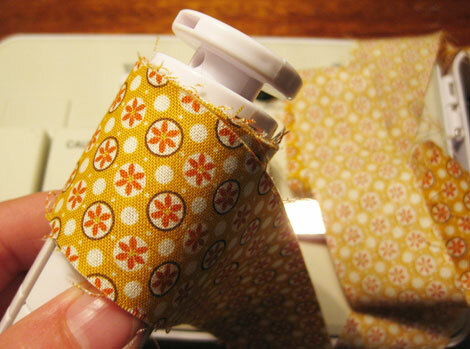 I use lots of hand-made bias tape but I do not love making it…this would make it much easier! I would love to win the cutter. I have purchased Simplicity patterns for about 20 years and I must say that they are the best patterns. I still have every one of them. Love you’re products. Glad I went over to Simpicity. I found a great pattern for iPod covers and laptops! I love “simplicity” plus size patterns,They are stylish and flattering and easy to sew.Id live to make my own bindings to make items really customized! I have used Simplicity products for years. Most of my sewing and craft patterns are Simplicity. They are easy to use and I have even combined patterns to make outfits to fit my style. I also save old patterns that I can revamp into current styles. The rotary cutter and the bias tape maker are both on my “list” of additions for my sewing needs. I love Simplicity products. Their double wedding ring template set saved my life recently. I sure hope I win! I’v always been a big fan of Simplicity patterns. I use them every year to make my niece’s Halloween costume and they really are easy to follow. I would LOVE to have a simplicity bias tape maker so I can make some wonderful outfits for my 2 yr-old daughter and complete some home dec projects!! Love the bias tape maker. Have had my eye on it, as I love using my own bias tape -but kind of dread making it since it is such a ordeal to do all by hand. Thanks for doing this giveaway!!! I love Simplicity patterns, and had no idea they had such great machines! I would be thrilled to win them! WOW! Love both machines–thank you Simplicity for this giveaway. Difficult to decide which tool is best for me , but the Rotary cutter & Embosser would be my choice. This would be fantastic. I have so many great Simplicity patterns in my stash this would enhance. Your creativity never ceases to amaze me! Many years ago, my grandma worked at the Simplicity pattern factory in Niles, Michigan. I grew up with Simplicity and seeing their products always brings a smile to my face! This is one of the coolest machines ever. Simplicity is a classic! Simplicity has been a staple for sewing as long as I can remember. I love using their patterns! What a wonderful giveaway!! I recently started learning how to sew again after a 30 year hiatus,my 9 year old granddaughter wants to learn to sew.We are learning together! As far as simplicity patterns,that is ALL I will buy,it’s easy sewing with Simplicity.I(WE) would love to have this bias maker to use,I also RE-STARTED crocheting again and I would love to crochet things from bias strips.Thank-You so much for this generous giveaway!! I MUST have one of these…I’ve been making MILEs of bias tape by hand! I think the Simplicity Cutter/Embosser would be a great item to have. Thanks for sharing your blog post with all of us. You are so creative! I have a bag I’ve had since high school (let’s not discuss how long ago that was) that I think I got at a military surplus store. I’ve always liked its utilitarian-ness, but now I think it may need some embellishment! bias tape would be great fun to make, and someone is going to have to send in a search party, ’cause i’m getting lost in the trims and embellishments on the Simplicity site! This tool looks amazing! I quilt and scrapbook, the ideas are already flowing on ways to use this for both hobbies!! I would LOVE to win this!! Oh, the wonderful things I would do with the Bias Tape Maker- whoever invented that is a genius! I didn’t realize all the stuff simplicity had on their website. I didn’t even realize they had their own rulers for cutting. Great information on that site! Thanks! I hope I get lucky! I really liked the Simplicity website’s quilting tools tutorials. I have never gone to their site — what a great resource. The bias tape maker would be a wonderful tool to have — thank you for just a great give-away! I love the look of the fabrics as bias tape with the bias maker! So Cute! Thanks for sending me back to the Simplicity site. I hadn’t been there in a while! Love to look at the new patterns and the free patterns. Would love to have either of these machines for adding to my sewing and papercrafting. ooo- I could SO use both of these machines! I want to start making clothes for my daughter and could probably wear them out on bias tape and trim alone! I love Simplicity products- these last and last and last! Love the Sew Simple patterns! My first pattern ever was a Simplicity pattern! I sewed myself a pirate costume (I don’t start small with table runners and things). I love Simplicity! What fantastic machines, I have a manual version of the bias maker but the mini built in iron is such a stunning idea. I never knew Simplicity made such things though I have used their patterns a fair bit over the years. Didn’t such wonderful time savers were available. Certainly would like to win one of them Thanks for making the giveaway possible. Have used Simplicity products for most of my life. Eu ficarei imensamente feliz sendo a vencedora deste brinde porque com certeza é uma maquina maravilhosa para fazer viés. Gosto muito de costurar, quando é preciso fazer um viés mais largo da muito trabalho cortar o tecido e fazer a mão. Agradeço por poder participar do sorteio. Sou brasileira . Abraços a todos. I love going to simplicity.com to check out all the great stuff they have to offer. I always check out their free projects page. I love most everything made by Simplicity. I have been drooling over the bias tape maker for some time now! If I don’t win, it is on my Christmas wishlist!! Oh, be still my heart! What an amazingly cool and fun product. Love the fun Halloween stuff they have popping up (already!). I think those goodies may inspire me to get a Halloween project from last year finished for my littles. Thanks for sharing and love your blog…such inspiration!